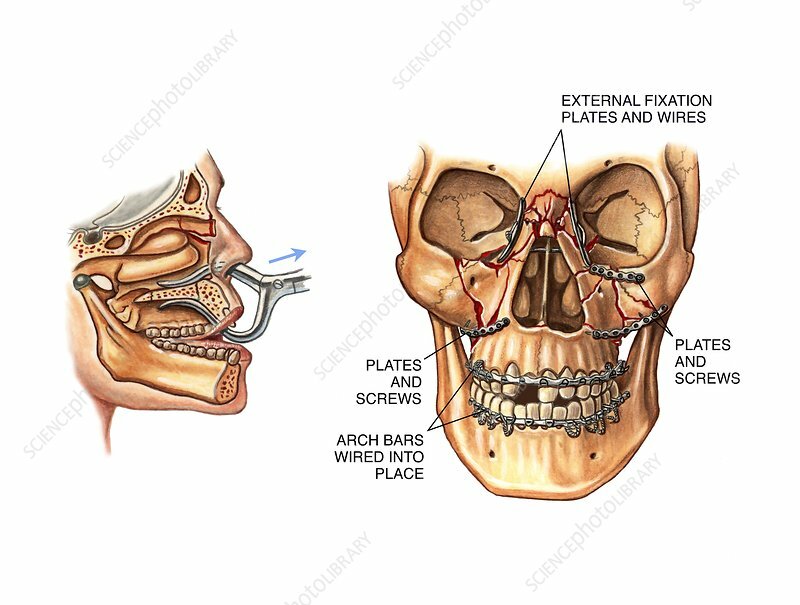 Facial fractures reduction and fixation. Labelled artwork of the reduction and internal fixation of fractured facial bones in a patient's skull. Such fractures are typically caused by blunt force trauma, in this case leaving the facial bones (upper and lower jaws, maxillary bones and orbits of the eye sockets) displaced from their normal positions. At left, forceps are used to pull the midface forward. At right, metal plates, screws and arch bars (with interdental wiring) are used in a process called internal fixation. The metal implants fix and hold the broken bones in place, allowing them to heal in their correct alignments.